“The Port City has many a wonder, but there are none more wondrous than a Wielder of Magicks. 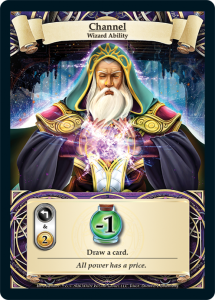 There is much to study on the Confluence, and the Wizards of Thandar are up to the task.” – The Emperor’s Guide to Thandar. The Wizard is a curious character. The starting deck has explosive damage, but the Gold can be unreliable. The Wizard also starts with the lowest Health of all the Characters, and since the Channel ability costs you Health, Wizarding suddenly sounds like a dangerous occupation..
“If you are able to befriend a Wizard, do so. Their protection and wisdom are often invaluable. However, you must be wary of Wizards that befriend you just to get at your hair, skin, or extremities, as they can be valuable spell components.” – The Emperor’s Guide to Thandar. Channel is arguably the most powerful class ability. 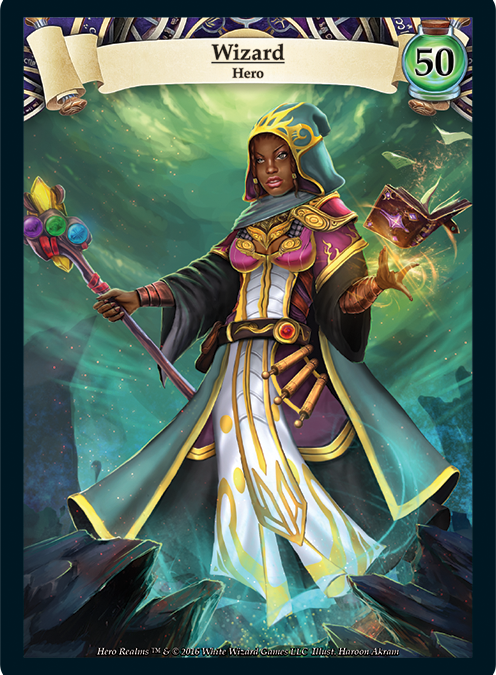 Most class abilities get better as the game goes on, but Channel is special in that its power is about equal to the average card in your deck. Since your starting deck is less effective, this ability will usually not be used in the early game (except to spend extra gold or draw enough damage to finish a champion). The loss of health is not insignificant either, using this ability even a handful of times will make a significant difference to your Health..
With Channel, deck quality is even more important to the Wizard than other classes. Once the average card in their deck is worth more than 2 gold, you can Channel almost every turn, and have a 6 card hand for the rest of the game. Channel also rewards you for knowing your deck. 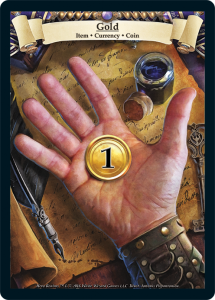 If you have a good idea that your top card is not a Gold, you can swing a turn, and possibly a game. Because Channel is a late game ability, cards that slow the game down and are better in long games tend to be better in the Wizard’s deck. This means cards that sacrifice weaker cards, gain Health to stay in the game, or draw more cards. Because the Wizard is such a late game powerhouse, playing against a Wizard means trying to kill them before the game goes on too long. It’s rare to see an ability that affects multiple champions, and this effect affects all of them! Fireball gets better against more champions, so try to save it for when your opponent lines up a few flammable targets, or you might use it to stun a champion that you wouldn’t have been able to. Sometimes, using Fireball against a single Champion is correct, especially if your deck has little combat, and the Champion in question will ruin your day. “Wizards have a thirst for knowledge. Sometimes that manifests in questions such as: ‘What would happen if that person caught fire?’ Try to not be that person.” – The Emperor’s Guide to Thandar. 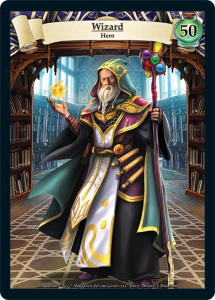 The Wizard Deck doesn’t have a lot of Gold when compared with other Starting decks, so you will need to manage this well. Grants 1 Gold, but makes the next Action card 1 cheaper. 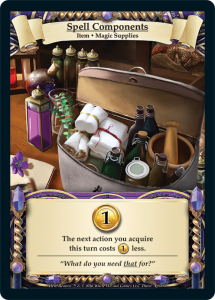 Since half the Market Deck is Action cards, you should have some easy Action buys, but don’t blind yourself to a potential Champion that may go well in your deck. 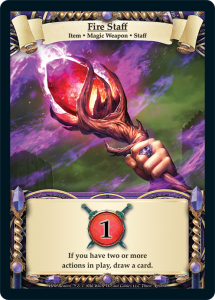 The explosive damage of the early Wizard Deck should take care of most early opposing Champions, and put additional pressure on your opponent. Depending on the aggressiveness of your deck, these will often stay to the bitter end. 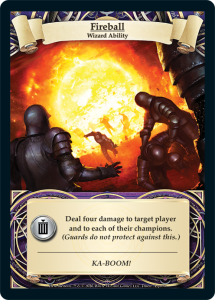 Draws a card when 2 or more Actions are in play (ie, make sure you play the two Action cards before this). 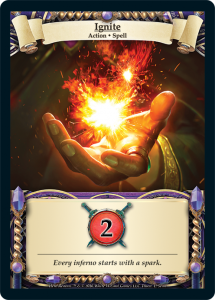 If your deck is Action-heavy, the Fire Staff will be amazing, but unless you can be assured of that, it can end up being underwhelming. If you have an Action in your hand, you should always consider Channeling for another Action to top off the Staff, and this is another reason for the Wizard to pick up sacrifice and draw effects. The Fire Staff will remain strong in the late-game when you are mostly guaranteed to draw a card with it. The Wizard Starting Deck is one of the few that comes with a Champion. 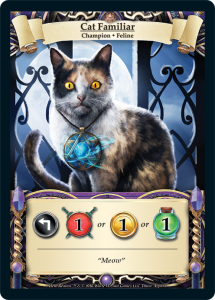 The Cat can be a workhorse, and if your opponent is not paying attention, they will sometimes leave your pet alone to wreak havoc. The Gold is most commonly useful, the combat is useful to finish off a champion, and the health if neither of those are needed. Often the Cat’s defense will act more like gain 2 health than a champion that will stay in play, but when it doesn’t become stunned it is very useful. “There are many times in which it is prudent to avoid a Wizard, and none more so than when you see one in an Ale House. Few forces are more destructive than a Wizard saying ‘Hold my Tankard’.” – The Emperor’s Guide to Thandar. With the low starting Health, and the limited buying ability, the Wizard can be tough to get rolling in a two-player game, but the explosive Fireball can be devastating when teaming up with friends, and the Wizard becomes a lot more powerful if kept alive.